The instruments were successfully tested at Albuquerque Seismological Laboratory of U.S. Geological Survey (Brokešová et al., 2012). 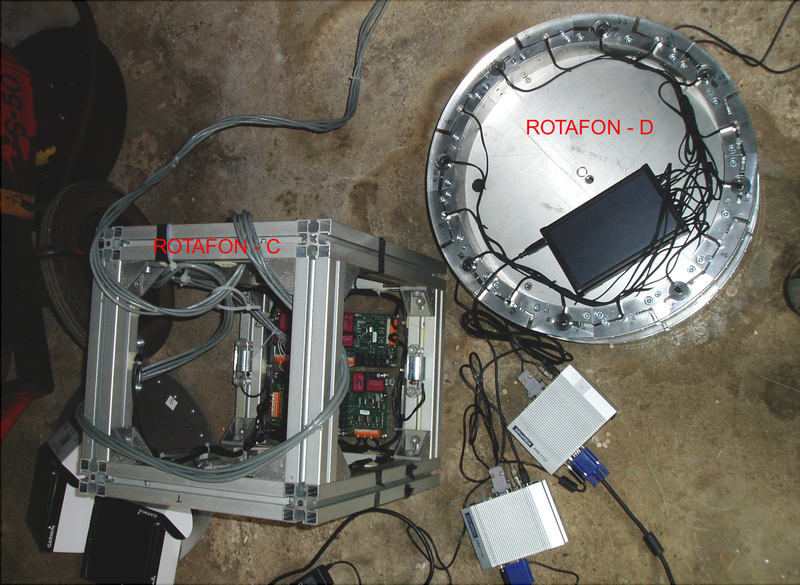 During the development of the Rotaphone, all the prototypes were repeatedly tested in laboratory conditions. In 2009–2010 the tests were carried on in the laboratories of the Faculty of Mechanical Engineering, Czech Technical University in Prague, and of the Institute of Geophysics, AS CR. At that stage the tests were focused on basic functionality of the instruments. In spring 2011, both 3DOF and 6DOF prototypes underwent thorough testing at the USGS Albuquerque Seismological Laboratory (ASL), New Mexico, USA (Brokešová et al., 2012). Albuquerque Seismological Laboratory is oriented especially on testing various seismic sensors, the rotational not excluding. It is equipped with a high-precision computer-controlled rotational shaking table (ARMS-260- ES16780, Aerotech Inc.) which can shake along the vertical axis or the horizontal axis, and further with a horizontal shake table of Russian provenance designed to produce precise translational motions (Nigbor et al., 2009). A fiber optic gyroscope (FOG; mFORS-1 143962-1000, Northrop Grumman LITEF Ltd.) attached to the table was used as the reference sensor. The tests were focused on functionality, linearity, and cross-axis sensitivity. Since 2008 we have organized a number of short-term as well as several-months-lasting measuring campaigns in various regions with totally different seismotectonic characteristics. The list involves regions in the Czech Republic (West Bohemia/Vogtland, the vicinity of Prague, the Hronov-Poříčí fault zone) and abroad (the Provadia region in Bulgaria, the Gulf of Corinth, Greece, and the volcanic complex of Eyafjalla and Katla in South Iceland). Selected results, ordered by epicentral distance, are listed in the table as examples. At present we have two such instruments in our disposal, one is funded by Technology Agency of the Czech Rapublic, TACR (project GAMMA, see also grant request), the other one, identical, was purchased with the support from the Department of Geophysics, Faculty of Mathematics and Physics, Charles University in Prague. TACR supports development and testing of this prototype.